PGA Village Verano is a country club-style community located in Port St. Lucie, Florida. In development since 2008 by Kolter Homes, the community has both new and resale homes available. The single-level homes and wide array of activities and amenities appeal to many homebuyers seeking a well-planned social community. PGA Village Verano welcomes buyers of all ages. Buyers have the option of purchasing a quick move-in home or building their own until the community reaches its total size of 1,800 residences. Each purchase includes a privileged PGA membership with golf discounts. In addition to golf, Verano provides a large array of programs to please many interest groups that match the wants and needs of any homebuyer. Residents can enjoy the expansive Club Talavera clubhouse amenities. It consists of a 19,000 square-foot clubhouse with all of the entertainment activities for homeowners. It includes areas like a lounge, sports bar, and coffee bar that's great for entertaining guests on evenings. Residents can have fun at the billiards room, two card rooms, an arts & crafts studio with kiln, library, learning center, and demonstration kitchen. Finishing out the indoor amenities is the banquet room where large parties and events are hosted for the community. Its extensive 13,000 square-foot Fitness Center adjacent to the Social Club includes a state-of-the-art fitness center with weight room and cardiovascular equipment. It also has a massage room, saunas, yoga and aerobics studio, luxurious locker rooms and a heated indoor junior Olympic-size lap pool and spa. The outdoor grounds include a heated outdoor resort-style pool and spa, two bocce courts, half basketball court, and four Har-Tru tennis courts. There is also a beautiful fire pit, event lawn, dog park, and plenty of walking trails. In addition, the PGA Golf Club has three championship courses, designed by Pete Dye and Tom Fazio, for 54 holes of world-class golf. It also houses the PGA Center for Golf Learning and Performance, a 35-acre practice facility ranked top ten in the world, and the PGA Historical Center Museum. Kolter Homes offers a variety of single-family home designs as well as villas floor plans at PGA Village Verona. The Bella Vista Collection offers two villa models ranging from 1,416 to 1,809 square feet of living space. These models have two bedrooms, two bathrooms, and an attached two-car garage. These floor plans are perfect for those looking to downsize without losing functionality. The Modena Collection offers single-family homes that are slightly larger than the villa homes. They offer 1,515 to 1,834 square feet of living space with two bedrooms, a den, two bathrooms, and an attached two-car garage. The Venezia Collection offers single-family homes from 1,600 to 2,255 square feet. Models in this collection offer two to three bedrooms, two to two-and-a-half bathrooms, and an attached two-car garage. Each model in this collection offers open floor plans and covered patios perfect for hosting guests. The Palmero Collection also offers the largest single-family homes in PGA Village Verano. These well-designed models range from 2,054 to 3,057 square feet of living space with three to four bedrooms, two to four bathrooms, and an attached two to three-car garage. Residents love these models for their open floor plans and private master suites. The home exteriors feature impact-resistant windows, Italian-inspired Mediterranean S-style tile roofs, traditional brick pavers on entry walks, and over-sized covered patios. Some of the appealing interior features include high ceilings, GE Energy Star appliances, granite counter tops, dual sinks and soaker tubs. Buyers can select colors, finishes and styles to suit their tastes at the Kolter Design Gallery. Residents at PGA Village Verano enjoy a million dollar golf resort lifestyle without the million dollar price tag. With the PGA Center for Golf Learning and Performance on site, even golf novices will feel welcome. Since the community also offers a wide variety of other opportunities, residents can enjoy everything from leisurely activities to fitness enhancing workouts. Some of the activities and clubs include swimming, tennis tournaments, book club, card night, bunco, learn to paint, dance class, and aerobics. At PGA Village Verano in Port St. Lucie, everyone can experience an endless vacation at his or her own pace. Located on the renowned Treasure Coast, PGA Village Verano in Port St. Lucie is in the vicinity of 21 miles of beaches and historic Fort Pierce. It is part of the larger PGA Village community. Water enthusiasts can enjoy swimming, boating and some of the best deep sea fishing in the world at the gulf stream that's just a few miles away. Other points of interest in the area include Lyngate Park, Savannah St. Preserve and the Maritime and Yachting Museum. PGA Village Verano is also just minutes away from I-95, making for an easy commute to Palm Beach, Vero Beach and West Palm Beach. Residents will love all of the amenities, social environment and quality-designed homes found in the luxurious PGA Village Verano in Port St. Lucie, Florida. Club Talavera is a social club that offers all the entertainment and activity amenities for residents. Club Talavera - 19,000 Sq.Ft. Residents have access to all of the physical and recreational activities within the Fitness Center complex. State-of-the-Art Fitness Center - 13,000 Sq. Ft. Residents can enjoy the 35-acre golf facility that helps golfers enhance their skills. There are plenty of activities available in PGA Village Verano. Here is a sample of some of the clubs, activities and classes offered here. The Bella Vista Collection offers two villa models ranging from 1,416 to 1,809 square feet of living space. These attached homes have two bedrooms, two bathrooms, and an attached two-car garage. These floor plans are perfect for those looking to downsize without losing functionality. The Venezia Collection offers single-family homes from 1,600 to 2,255 square feet. Models in this collection offer two to three bedrooms, two to three bathrooms, and an attached two-car garage. Each model in this collection offers open floor plans and covered patios perfect for hosting guests. The Palermo Collection also offers the largest single-family homes within the community. These well designed models range from 2,054 to 3,080 square feet of living space with three to four bedrooms, two to four bathrooms, and an attached two to three-car garage. Residents love these models for their open floor plans and private master suites. This community is great! Quiet, safe and the neighbors are friendly. We feel the HOA fees are fair for the amenities that you receive. HOA fees are VERY HIGH and going UP. The HOA does nothing that I can see. They want the place to look nice for sales but once you are here - NOTHING. Sorry I ever bought in here. 54-holes of golf ... need I say more? If you love golf this is the place for you! My game has improved immensely since I've moved here and play so often. It's really exciting to finally improve my game and meet some great new folks to golf with. We've been happy with everything about living here. The house is great, the people are nice and the golf is heaven! 55places.com is not affiliated with the developer(s) or homeowners association of PGA Village Verano. The information you submit is distributed to a 55places.com Partner Agent, who is a licensed real estate agent. 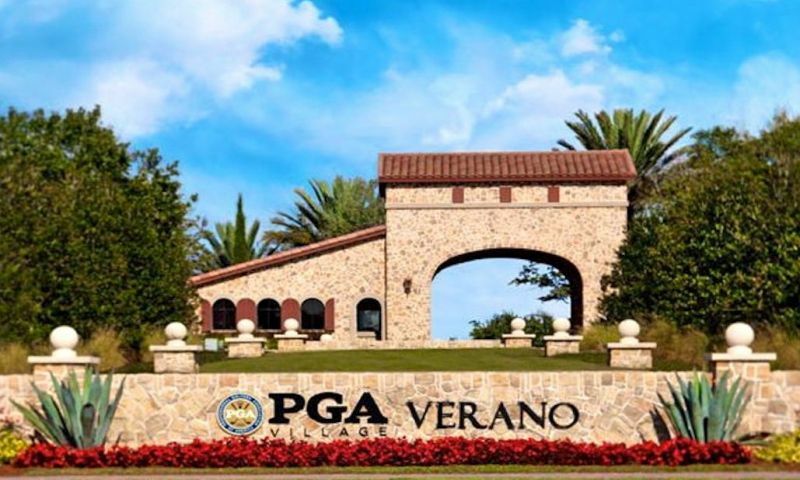 The information regarding PGA Village Verano has not been verified or approved by the developer or homeowners association. Please verify all information prior to purchasing. 55places.com is not responsible for any errors regarding the information displayed on this website.